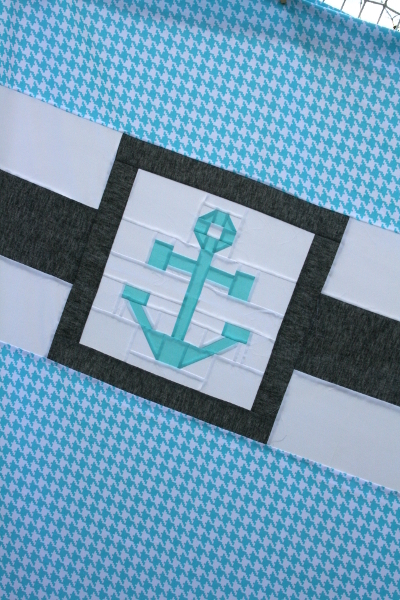 Most of the time I am able to make backings for my quilts without much trouble, but for some reason the backing for my anchor quilt top was a struggle. I had my heart set on a specific fabric but couldn’t find it anywhere. Then I ordered a print I was sure would work, but when it came the blues were so off that it wasn’t an option. I found another print I liked but again it was out of stock everywhere. I went to several quilt shops looking for something I liked. And then one afternoon I decided to more earnestly look through my stash for something I could make work and found this turquoise houndstooth print by Paula Prass for Michael Miller several years ago. Not quite enough for the backing, but enough to get started. 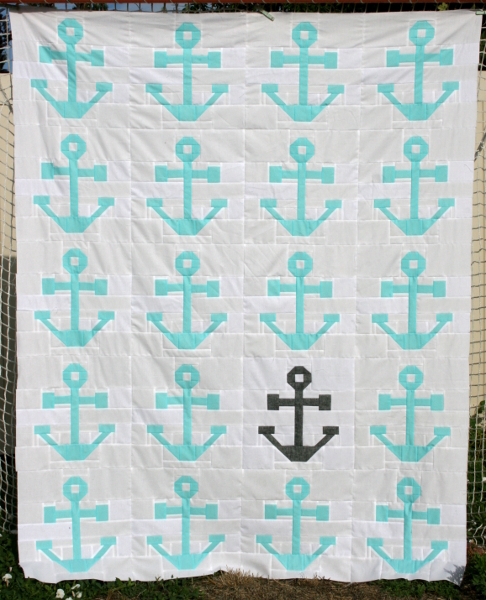 I made another anchor, surrounded it with the same black linen that I used for the black anchor on the quilt top, and pieced it together. While it’s not what I envisioned, I’m happy with it. To make things more frustrating, I’ve had little time to sew and when I could sew, we had overcast skies so my photos aren’t good. Nevertheless, it’s ready for basting! 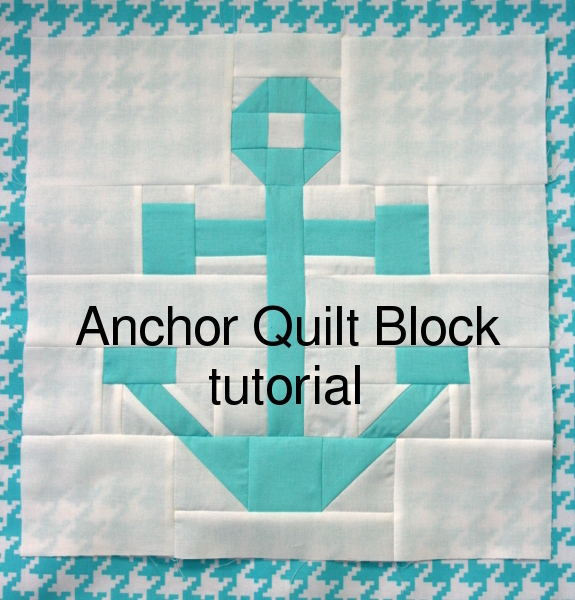 And although the same cloudy skies made it difficult in the ten minute segments of time that I had, I finally put together a tutorial for making your own anchor block! You can find it here. I hope you make one! 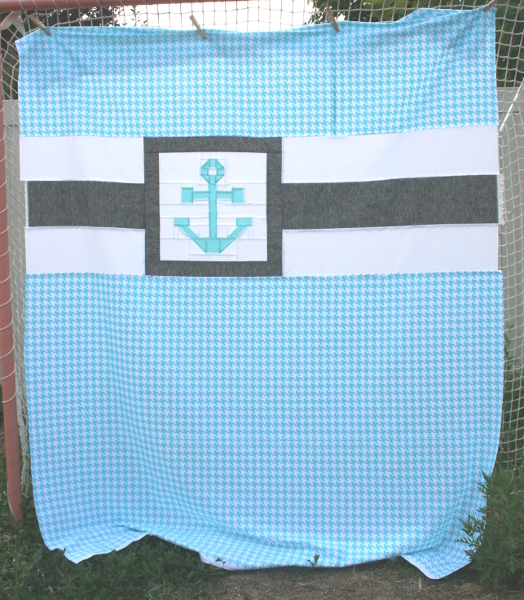 That houndstooth is gorgeous and you might have just made the absolute most gorgeous backing I have ever seen! Ps, I’m totally making an anchor today after work!